Submitting a listing to 1MillionBusinesses.com is quick and easy. This tutorial will guide you through the submission process. Browse through the categories / sub-categories listed on the Home page of 1MillionBusinesses.com and choose the most appropriate sub-category where you would like to submit your business or website. 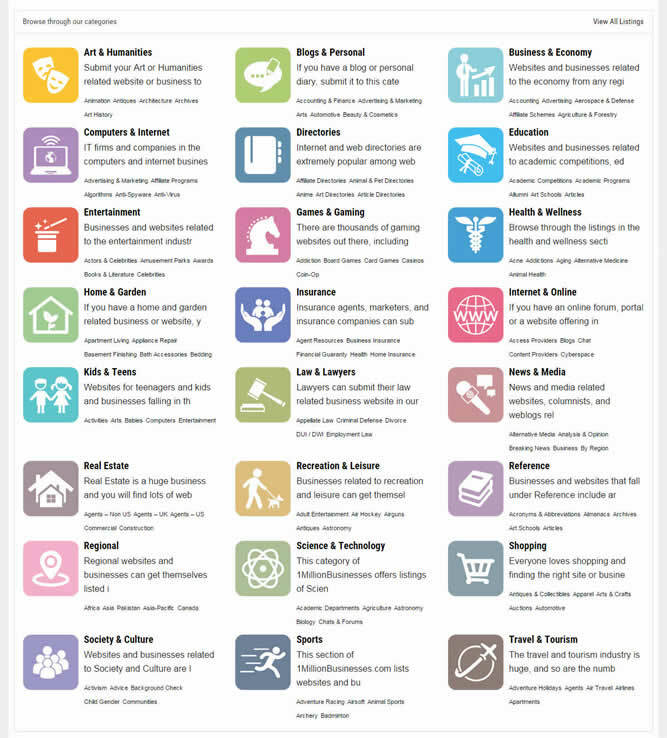 Alternately, use the Category Structre to browse through all the categories and sub-categories all at one place to select the one which is best for your listing. NOTE: In case you cannot find a suitable category / sub-category for your listing, send us an email at contact [@] 1millionbusinesses.com with the category / sub-category name and we will add it for you. 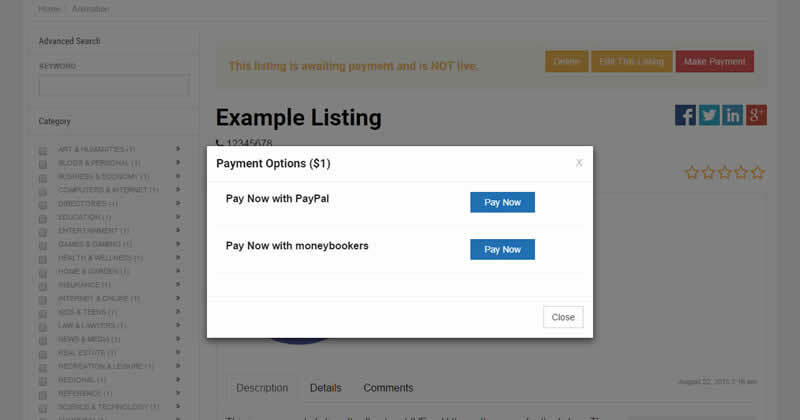 Click on ‘Add Listing‘ from the top menu and select a listing package by clicking on ‘Create Listing‘. 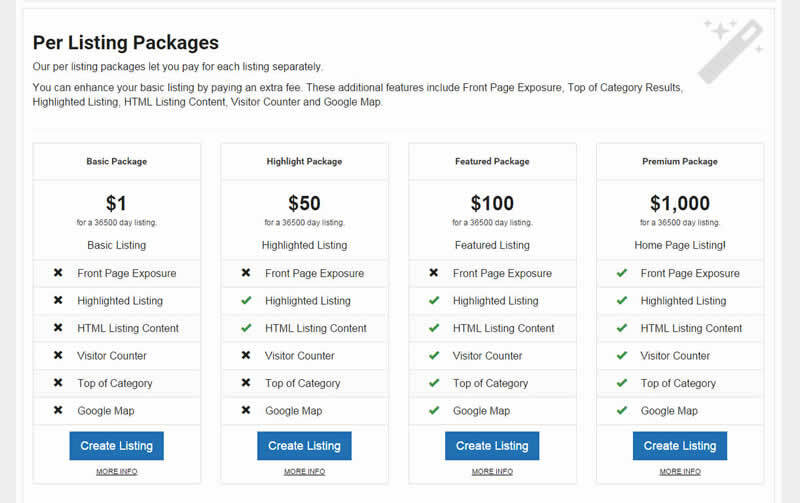 Premium Package – $1000 for front page exposure! Depending on whether you are a new or returning visitor, Register or Login to the website. This will take less than a minute. Fill the form with your listing details such as Title, Description, Keywords. Choose a listing category / sub-category. 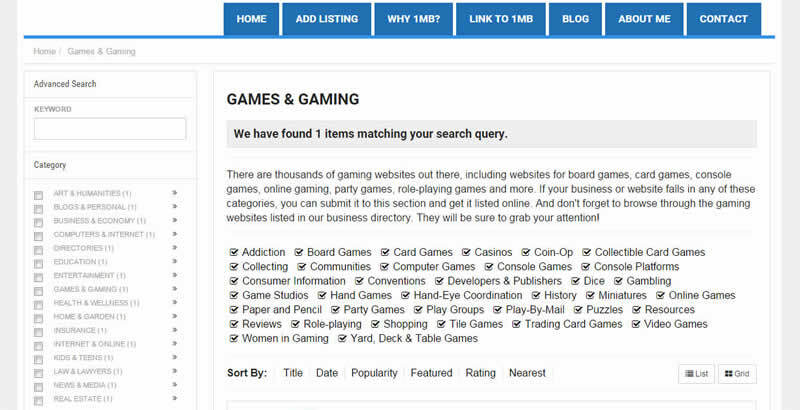 Basic listings allow 2 maximum categories. 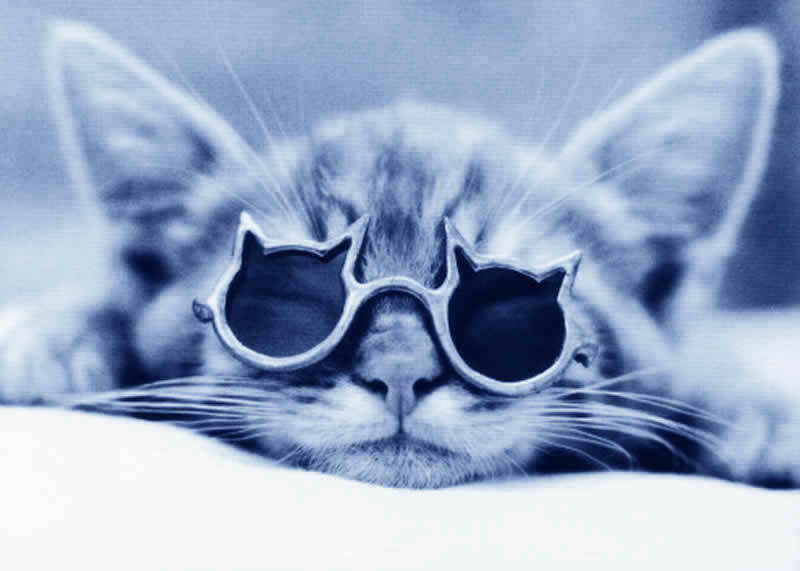 It is advised to choose the most relevant, niche sub-category to make it easy for others to find you. Upload attachments for your listing. 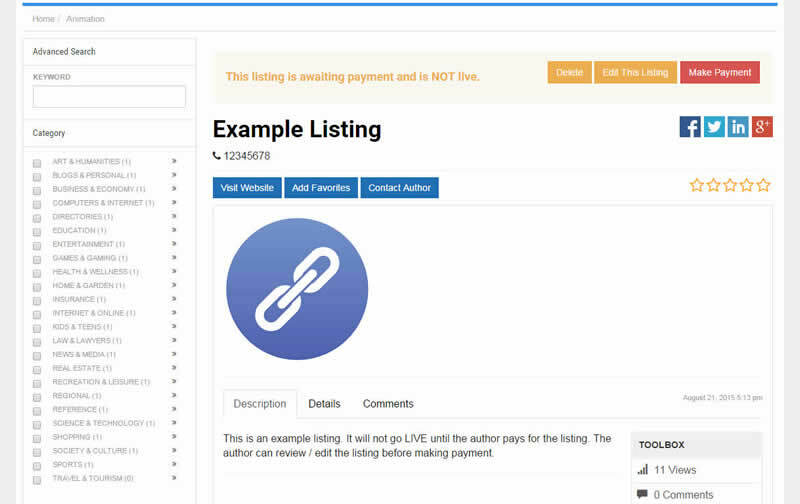 Basic listing allows 1 media file. Provide Website Link and Phone Number for your listing. Listing enhancements can be chosen at an additional cost. 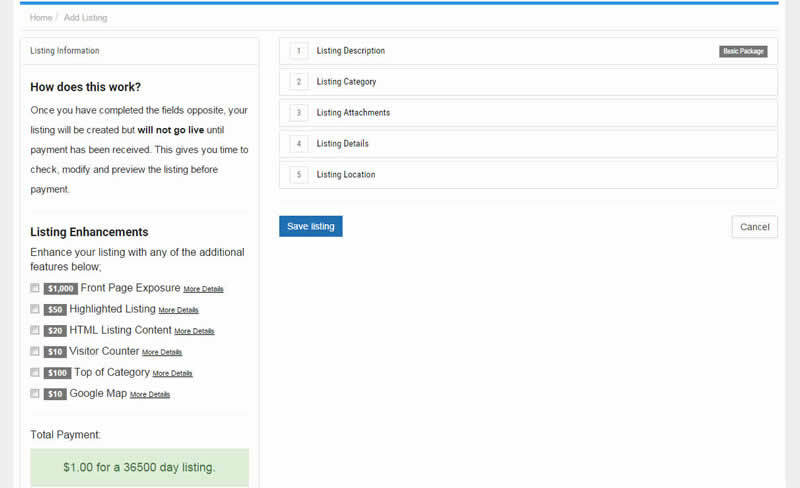 Your listing is now created. You can edit/review it as many times as you want. It will NOT go LIVE until payment has been received. Select the payment option you want to go with. Step No. 7 – Sit back and relax! Now that you have paid for your listing, you can sit back and relax. Your work is done! Your listing will be reviewed within 24 – 48 hours.